Windows Phone Thoughts: Want to Develop a Windows Mobile 6.5 Game? Want to Develop a Windows Mobile 6.5 Game? "Windows Mobile Game Development will tell you everything you need to know to write your own games, using the powerful Microsoft Visual Studio development environment and either C# or VB.NET. In Windows Mobile Game Development I give you everything you need to allow yourself to maximize your own creativity and bring both yourself and the world some fantastic mobile gaming opportunities. Just think about how a gaming device is always in your pocket, as a phone always is... it's too good an opportunity to miss, so I'll show you how to create the games you want to make." 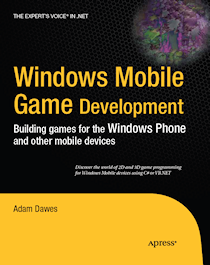 Adam Dawes dropped us a line to tell us about his new book on Windows Mobile Game Development. It's out now, but covers WinMo 6.5, so it may not be as timely as some developers would want. Of course if you're into developing games for the excellent HD2 or similar premium hardware, then this may be the book for you.